Scissors and tape, if that’s what it takes! I type her jabs into comments in the manuscript, and then I tell myself to keep writing and deal with those problems later. And I do keep writing, but all her jabs accumulated back there in the dark recesses of later, and started haunting me. A few nights ago, I woke myself worrying I might not be able to sort this book out. What if it’s too discombobulated to fix? Wait! What was that about cutting and taping? I did that? Yes I did, but I’d completely forgotten. Have you ever heard a writer compare the process of writing and publishing a book to pregnancy and birth? To continue that analogy, after you have your bundle of joy book in your hands, you tend to gloss over the worst parts of getting to that point. 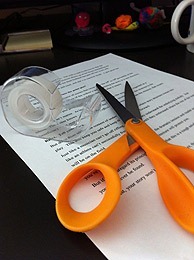 Indeed, I’d forgotten there was a point in editing The Brevity of Roses where I printed it out and then sat down with scissors and tape organize some of the scenes, and even paragraphs, in better order. I couldn’t seem to accomplish that scrolling back and forth on the computer. My manuscript was a chopped mess for a while, but I worked it out. Rah, rah and all that jazz! I hope none of you have to resort to scissors and tape, but if you do, take heart. You can fix it. You’re a WRITER! Previous postDo you write up and down? Next postDown, but not out …. and a giveaway! Good luck with the cutting and taping 🙂 I haven’t had to do that, but I can see how it would help get things in shape! Thanks, Cassie. I’m not there yet, but I can see it coming. 🙂 Maybe I’m the only one too mush-brained to reorganize on the computer. Nice to see you, Kasie. 🙂 Oh yes, I’m finally making progress on the novel. I’m slow, but I’ll get there. Hi Linda! Wanted to see what you were up to. And yes, in the past I’ve had to use scissors and tape and a whole room to sort things out. At the moment, though, after compiling a list of all those little comments I made while reading the ms over (and I have pages and pages of them), I am just addressing them one by one. And I am loving it. Not only can this kind of revision be done in short bursts, but each time I go in to “fix” something, I discover a new opportunity.